Shelby Foote writes, in the afterward section of this, the third volume of his monumental history of the Civil War, how relieved he was to finally finish this labor of love after researching and writing for twenty years. A literary effort begun to commemorate the centennial of the Civil War ended long after, in his description, the centennial enthusiasm had dried up. True, a centennial celebration itself fizzles out, otherwise we, or rather our descendants, would never eventually get re-excited about a bi- and a tri- and on and on .. centennial. I'm not sure Foote is implying with this statement that Civil War enthusiasm waned after the mid-1960's, but if it took a dip, it was only temporary. Thanks to Foote and others, including Ken Burns, the American Civil War continues to fascinate generations of readers.It isn't necessary to read the three volumes of Shelby Foote's "The Civil War" in order, but my experience from doing so imparted the feeling that I had been exposed to the whole grand majestic scope of this struggle. Foote is all-inclusive in his choice of the war's significant struggles. His motive is revealed literally on the last page of prose (page 1065) in which he states that his writing aim was to provide a "more fitting balance" than many histories provide, by showing the patient reader how the actions outside the state of Virginia, vaguely labeled as in "the West", had no less importance to the war's outcome than the well-known battles such as Gettysburg and Chancellorsville.Foote shows how these geographically wide pieces fit into the 1864 puzzle in his first chapter, aptly titled "Another Grand Design". In the spring of that year, another recently-appointed Union commanding general, Ulysses Grant, launched a multi-pronged attack designed to hit the Confederate forces in numerous locations ranging West-to-East from Arkansas to Virginia. The greatest Union concentration of forces, personally accompanied by Grant, was the Army of the Potomac, which had had three years of up-and-down morale as various of Grant's predecessors tried to crack the nut of opposition to Robert E. Lee's Army of Northern Virginia. All of these various conflicts occurring on land and water are narrated by Foote, who never loses the magic touch of making you feel the gravity of the struggle between blue-and butternut-clad armies, while making the reading experience compelling.As we know in retrospect, the time period covered in this third volume parallels the long, painful series of events leading to the Confederate downfall. Not that anyone knew for sure what the outcome would be, or when it would occur, as Grant started his spring, 1864 invasion. He may have been the national hero of Donelson, Shiloh and Vicksburg in the Western theater, but he was up against the best general in the Civil War now. With Grant, Lee continued his pattern of keeping his forces from being smashed by larger Union armies, while always inflicting heavier casualties against his opponent. Grant found himself being set up on numerous occasions for a smashing blow from Lee which would force him to withdraw from the field; he countered these sometimes surprising threats by "sidling" his army eastward across Virginia in a campaign we now know as "The Forty Days", as violent, bloody clashes occurred from The Wilderness, to Spotsylvania and Cold Harbor. Foote graphically describes the "concentrated terror" of one terrible day, when the struggle at the "Bloody Angle" at Spotsylvania involved fighting by both sides across a parapet at literally arms' length, a "waking nightmare" going on for sixteen hours, a defense as much as it was an attack by either side, where neither victory nor defeat mattered, and fighting continued on and on, under the influence of pure adrenalin, and "Slaughter became an end in itself" (p. 221). This one day resulted in 3000 Confederate soldiers captured, killed or wounded compared with 6820 of their enemy. And this day followed numerous others already involving many thousands of casualties on each side, to be followed by many more. Lee would somehow be able to block Grant again and again, in order to protect Richmond, the Confederate Capital. The cost of constant attrition of his forces during the spring, summer and fall of that year would find the two armies facing each other outside Richmond, at Petersburg. By November, Lee knew he was on the verge of calamity because his forces were spread very thin, and there were no more reinforcements to be had. Grant would continue to plan for the breakthrough that would send Lee's forces reeling from their intrenched positions, and it was provided by one of his most aggressive generals, Phil Sheridan, whosethrust at Five Forks on April 1st, 1865tarnished the reputation of George Picket and began the unravelling of Lee's defenses. One of the Civil War's most dramatic chapters occurred while the Confederate government abandoned Richmond, beginning its itinerant railroad journey to avoid being captured, while Lee evacuated his army westward in the long-shot attempt to get the survivors of his forces to meet with General Johnston's army in North Carolina. Foote shows how Lee and his exhausted army never considered giving up trying to keep the fight going until Grant's relentless pushing of his forces finally boxed in the Confederates at Appomattox Courthouse. There were other Confederate forces still in the field, but Foote makes it clear how Lee's April 9th surrender gave really no alternative to the holdouts, forcing Richard Taylor to surrender his army of the Department of Alabama, Mississippi and East Louisiana to Federal General Canby, and Johnston to surrender his army of the Department of North and South Carolina and Georgia to William T. Sherman. Meanwhile, President Jefferson Davis was pursuing the hope of some kind of Confederate government-on-the-run survival, moving from town to town with his cabinet, on the Danville and Richmond Railroad, as cabinet members gradually gave up the cause and bugged out of Davis' retinue. Foote, a Southerner sensitive to the not-so sympathetic treatment given to Davis' memory by historians, documents the treatment and mistreatment received by the forever unrepentant leader from his capture in Georgia, to his long, harsh imprisonment and beyond. The war bestowed two legacies to Americans. Regarding the first, Foote notes the struggles Abraham Lincoln had in uniting what remained of the remainder of the United States in order to militarily recover the section that had departed, living to see this goal fulfilled, but not living long enough to observe how his returning veterans realized that a nation emerged from the crucible of strife. He writes: "They knew now they had a nation, for they had seen it; they had been there, they had touched it, climbed its mountains, crossed its rivers ....their comrades lay buried in its soil, along with many thousands of their own arms and legs." (p. 1042). The second legacy directly affected the southern veterans, who would also be part of the new nation but would claim membership in a new country south of the Mason-Dixon line; as their claim to nationhood through secession was denied, they claimed unity through pride in enduring a terrible war, the end of which was marked by a villification of their former leaders as instruments of Lucifer, and which was followed by the societal disruptions of Reconstruction and its aftermath. As Foote states: "Not secession but the war itself, and above all the memories recurrent through the peace that followed - such as it was - created a Solid South, more firmly united in defeat than it had been during the brief span when it claimed independence." (p. 1042).Why bother studying History, especially the Civil War? Because, otherwise, it is impossible to understand the difference, to paraphrase Shelby Foote, between "the United States are" and "the United States is" (p. 1042). 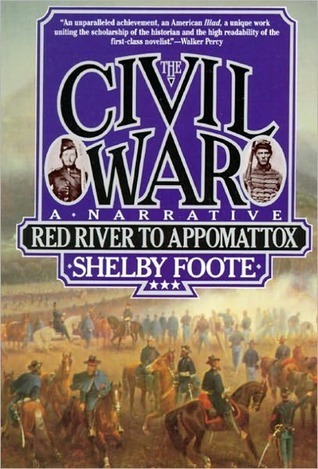 I have spend most of the last three weeks reading the 1,100-odd pages of Shelby Foote's The Civil War Volume III: Red River to Appomattox. I had mislaid the book for several years and was so delighted when I found it behind other books on a shelf that I began reading it at once.Unlike most of the other major histories of the Civil War, Foote's 3-volume series is written from he point of view of the Confederacy. I do not mean to imply that his history is biased. Rather, it covers the same ground from a different viewpoint that most Northern versions do not and cannot have. On the last page of this volume, he writes:Perhaps in closing I might add that, although nowhere along the line have I had a “thesis” to argue or maintain -- partly no doubt because I never saw one yet that could not be “proved,” at least to the satisfaction of the writer who advanced it -- I did have one thing I wanted to do, and that was to restore a balance I found lacking in nearly all the histories composed within a hundred years of Sumter. In all too many of those works, long and short, foreign and domestic, the notion prevailed that the War was fought in Virginia, while elsewhere -- in an admittedly large but also rather empty region known vaguely as “the West” -- a sort of running skirmish wobbled back and forth, presumably in a way for its participants, faceless men with unfamiliar names, to pass the time while waiting for the issue to be settled in the East.Foote was true to his plan, and his history takes us from Sumter to Palmito Ranch, the last battle of the War, near Brownsville, Texas.This is a great history -- and a very long one. But it is told well by a master historian. The last in Shelby Foote's Civil War trilogy, this one covers spring of 1864 through the end of the war. Foote's trilogy is a good reference for those who are looking for a thorough, sequential narration of the events of the Civil War. The series does not step back and analyze the events, so you don't really ever get a sense of the bigger picture or what the pivotal moments of the conflict were. These 3 volumes are a play-by-play, mostly of the battles, but also cover some of the politics in both Washington and Richmond. I found it valuable in that it helped me gain an understanding of the overall flow of the war and how the events unfolded. towards the end of this massive trilogy foote shows a bit more of a sensitivity towards certain issues that he was maybe more ignorant of when he started. in the course of writing this series, foote lived through the civil rights era in the south, and i think it shows, particular in his comments about the awful failures of reconstruction. or maybe im just searching for things to validate why i enjoyed this series so much, which i did, despite foote's flaws and obvious sympathies for the confederate cause. i think it is very much worth reading. i doubt you'll find a better, more detailed narrative of the war from beginning to end, and as long a you keep a critical eye towards the author's biases i think there's a lot of value to a work like this. Amazing! Stupendous! Incredibly enjoyable! Shelby Foote finishes his mammoth three volume narrative of the American Civil War with amazing erudition and, at times, passionate prose. Despite it being longer in length than his two predecessors, Foote manages to balance his switching from fast battle narrative to slow detail-bogged passages better than the first two volumes. He also has some of the best and most moving chronicles out of all the volumes in this one volume. Of particular note are the fight in the bloody angle at the battle of Spotsylvania, a full account of Lincoln's last day and final moments, and a few pages at the end describing the feelings that some of the soldiers had at the ending of the war (just before he ends the book about what Jefferson Davis did after the war) which is easily recognizable to any fan of Ken Burn's documentary of the Civil War. As with the other volumes though, this should not be read if you do not have the longevity and endurance necessary to read it and without having read the previous two volumes first. But, if you do, then you will have gained a greater appreciation for what Mr. Foote calls THE central event in American history, if not in world history. What a great conclusion to this narrative. Shelby Foote did such a great job keeping the narration balanced on both sides, and engaging. The combination of the three books is rather lengthy, and had I spent the time to review the maps at the same time, I probably would have enjoyed it even more.Even as it was being narrated, I found the ending of this pivotal war to be bittersweet, and I genuinely felt sorry for the south. I loved this quote from Ulysses S. Grant at the surrender of Robert E. Lee's army, "I felt like anything rather than rejoicing at the downfall of a foe who had fought so long and valiantly, and had suffered so much for a cause, though that cause was, I believe, one of the worst for which a people ever fought. "The ingenuity displayed by the South was remarkable, but the sheer power and numbers of the North was ultimately their undoing. It's fascinating that such a significant event in America's history barely took more than four years. In finishing this book, I have completed one of the great reading experiences of my life to date. As in the previous two volumes, Shelby Foote's ability to render a general yet hugely informative history of the Civil War is simply astounding. On a par with his skills as a general historian, he brings to bear all of his skills as a fine novelist in presenting the narrative of the war. In a volume exceeding a thousand pages, he is able to bring the reader to tears, to take the reader's breath, to provide passages of such eloquence that one must re-read them again and again. One comes away from finishing this last volume of the trilogy with a sense of accomplishment, of having had the privilege to read one of the great works of American literature. The trilogy is very much more than a history book. From the dip pen of Shelby Foote, history becomes literature. This is not an easy thing for an author to accomplish, particularly on this scale. Shelby Foote has accomplished it and the reader, at the conclusion of this third volume, can take pride in having been there with him for each and every word. Have often returned to a chapter or two for reference, re-piqued interest froma TV show, or say when we biked around the Vicksburg battle field one summer. The interviews with Shelby Foote in Ken Burns' Civil War series were fascinating. Inspired, a girlfriend, who was from Mississippi, gave me a volume for each of the next holidays, birthday's etc. These books read like novels, hard to stop once you get going, even though yeah we know how it ends. Can't endorse this series enough. I'll read them again when I have the time. That Shelby Foote could produce 3,000 pages of prose of this quality is one of the greatest achievements of American literature, let alone narrative history. Reread and rating changed from 3 to 4. More appreciated the 2nd time through. Another must read for all interested in American history. This trilogy is really the definitive history of the civil war presented in a very readable style. It has been criticized for omitting mention of some of the atrocities committed by both southern and northern troops, but this is not an important omission. Finally finishing once again (3rd time) the thousands of pages of this definitive history of our civil war. So very well written. So sad for Americans to read. Volume III begins with Grant's move to the East to become the general in chief, the man to win the war.By chance this week the NATO forces ended combat roles in Afghanistan and the news clips pointed out the great sacrifice of 2,200 American dead during the course of 13 years of war. As a contrast, Grant marched south with his army to give General Lee serious battle.At Cold Harbor Virginia Grant attacked and in in 8 minutes 8,000 Americans were dead, Almost all of them Union soldiers. That is what serious war is about.At this point the course of the war changed for good. Before Grant marched south to fight Lee, six Federal generals had done the same, been whipped, and then retreated back north. It was assumed that Grant, having been whipped, would do the same and now retreat to the north. Instead Grant moved his army to the left to outflank Lee and attack again. Retreat by the North was over and the end of the war had begun. The South could not afford the losses in these battles and the North could afford them. It was now a war of siege and attrition that only the North could win.As it became apparent in the South that the war was lost there were some cries for peace with the Union and acceptance of the end of slavery. Claims that the war was not about slavery. This was immediately repudiated by the great major of Southerners saying "of course the war was about slavery, what other property do you think we were trying to preserve!" So the war continued.As it becomes more obvious that the South cannot possibly win, Jefferson Davis issues proclamations bordering on lunacy about how the Confederacy will now triumph. Quite reminiscent of Hitler in his bunker at the end. Davis truly hated the North and it is not clear why. It is hard to believe that he thought slavery a sacred moral right of the South, but perhaps so. Davis would never mention slavery per se, but simply the rights of the South.Finally at the end we have the always painful details of the Lincoln death bed in the shabby house across the street from Ford's theater. So tragic for our history.I have read this again 6/16 and now rate it 5 stars versus 4 stars at my first read. The entire trilogy is a masterpiece of historical writing. I really did not fully appreciate it the first time through. The blurb on the cover of these books describes the series as an American Iliad which doesn't at all to me seem like an overstatement because I can't think of any other group of American books, fiction or non-fiction, that encompasses the scope of this series. The facts of the Civil War are pretty well documented throughout the 3000 pages or so that Foote has written but it's a testament to his writing ability that these books are such a compelling read. I found myself tearing up when he was describing Lincoln's deathbed. Hell, I got a little misty reading about Jefferson Davis' death. Here's a great quote from the third book that gives you an idea how great, and darkly funny, Foote is as a writer:"Westward to the Mississippi and north to the Ohio, Confederates did what they could to offset the loss of Atlanta by harassing the supply lines that sustained its Federal occupation. John Morgan was not one of these, for two sufficient reasons. One was that his command had by no means recovered from its unauthorized early-summer excursion into Kentucky, which had cost him half of his 'terrible men,' along with at least a great a portion of what remained of a reputation already diminished by the collapse of his Ohio raid the year before. The other was that he was dead"Foote treats both sides fairly while acknowledging the weaknesses of both. If I had to find one fault about these books is that maybe Foote is leading the narrative here just a little bit. Certain figures seem to be constantly lauded (Lincoln, Lee, Grant, Sherman, Bedford Forrest) while others (politicians, most other Union generals) can't seem to do anything right. Not being an expert, I can't say that his opinions of these people aren't well-founded, but it just struck me as a possibility. I can't recommend these books enough. I would think that every American should read these books just to get an idea how close we were to splitting into two very different countries and, even with the ridiculous partisan battles that go on these days, how lucky we are that we are united. When you finish a trilogy like this you feel a sense of accomplishment. I can't even begin to imagine how Mr. Foote must have felt in completing this work, three thick volumes telling the story of one of the most crucial times in our nation's history.The Civil War, Vol. 3: Red River to Appomattox concludes an epic but does not satiate my passionate interest in the Civil War itself. It is to the author's great credit that he has told this monumental story not as a series of dry historical battles and campaigns, but rather toured our bleeding nation, North and South, for those pivotal years describing events as they unfolded with compassionate reserve, fascinating insight, and a gallant dash of panache thrown in for good measure. The War Between the States was carnage on a scale we can scarcely imagine today, but it would compound the travesty to dismiss it as such without understanding the people who lived and died it, what they believed and the ideals they fought for. Mr. Foote gives us their voices.Highly recommended! I reserve 5 star ratings for the best. I never expected to rate this volume this high. Foote never provided citations in any of his Civil War histories, but the narrative makes up for his lack of footnotes. Foote's recounting of the battle of Franklin and his comments about the end of the war and how the men who fought it knew they were ending something special, a brotherhood, both North and South, that was hard to explain to those who had not fought, was beautifully written. In the beginning of the audio book for this Volume III, Ken Burns provides a wonderful intro. He refers to the futility of war and the dark era that followed in which the wealthy freely wheeling their power to the detriment of American people and economy and how the African-Americans continued to struggle for their freedom in the subsequent Jim Crow era. Shelby Foote does not go there. After more than 1,200 hours of narration (superbly done by Grover Gardner) it becomes clear that the American Civil War was not waged to free the slaves but to squash the rebellion in the South, asserting the States rights to hold slaves. Throughout the 4 years of war--waged unnecessarily and unexpectedly too long, as all wars are--the dominant reason for the war was to save the Union (for the North) and to preserve the States' sovereignty and (ultimate) independence (for the South). The political justification and rhetoric remains still the same: We go to war (Iraq and else) to preserve the US sovereignty; or we oppose Obama Care to assert the States' sovereignty. Nothing has changed. The American Civil War is a tragedy, particularly because it divided families, friends, and the old comrades. Lincoln's wife's family members, for example, fought for the Confederate Army. Both the "bluecoat" and the "butternut" generals, leading the armies against the other, were all West Point graduates, including Ulysses Grant and Robert Lee. There was no reason to fight. But they did--bitterly--once a blood was shed at Fort Sumter, South Carolina, in April 1861. As the casualty rose, the stronger the resolve became from each side against the other. Had they known the cost in advance (well over 1 million total casualties, including death due to illness, in more than ten thousand military engagements), they would not have began the War. But once it began, it had to be fought to the bitter end. "You fight to win, and you win by killing," one captain said to his disbelieving family members. And the needless destructions that Sherman's and Sheridan's armies brought to the South--in order to deprive the South the chance to ever rise up again in arms, only to be rebuilt later in the Reconstruction ear. It would not be too much of an exaggeration to say that the American Civil War was fought in two rivers: Mississippi and Rappahannock. The siege and capture of Vicksburg tilted the war agains the South for inevitable defeat. The skirmish on and around Rappahannock between the Army of the Potomac and that of the Northern Virginia defined the stalemate that lasted for the much of the duration of the War. The War could have had a different outcome, had Robert Lee's daring campaign to bring the War to the Northern soil, Gettysburg, Pennsylvania, succeeded. Due to a blunder in communication, the cavalry unit that Lee counted on arrived a day late, causing the battle to tip in favor of the lukewarm Northern general George Meade. Another prior blunder costed the South dearly, when the aggressive and cunning "old fox" General Lee lead the proud Army of the Northern Virginia to attack the Army of Potomac with the aim of reaching Washington, DC. This time too a careless captain or messenger roled his cigar with the paper on which Lee's strategy and military instructions were written, which in turn was accidentally discarded and ended up in the hands of a Northern soldier. Knowing the enemy's plan in advance, it was easy for George McLellan to out do Robert Lee, not withstanding the superior force and resources McLellan had. Such was the bitter luck of the South; but such incidental things often determine the outcome of wars. Just as the War was shaped by incidental factors, Lincoln's second term election too was determined by the unpredictable battle results from the fields. Lincoln owes his second term presidency to Sheridan's victory in the Shenandoah Valley. Without it, Lincoln would have been soundly defeated (by his former General McCellan, who, beloved by soldiers, was fired by Lincoln) for prolonging the war so long. (A good part of the delay was due to Lincoln's military interference with his General and McClellan's and (later) George Meade's inaptitude for sound military ventures). Lincoln almost did not go to participate in the memorial event at the Gettysburg cemetery on November 19, 1863. He was only a secondary speaker to the main orator of the day, Edward Everett, who delivered a resounding 2 hour oration. Lincoln's speech was so short in contrast that the photographer did not even have enough time to set up his tripod to take a picture of him delivering the now famous speech. Drawing from a supporter's letter he read a day before, Lincoln wrote down a few words on a scratch paper on his train ride to Gettysburg. But in a short 272 word speech he elevated the war to the lofty height of the ideal: that the war was waged for the people's government, just the way the Constitution that begins, "We the people...," would have us believe. Lincoln had the uncanny ability to elevate the struggle to a new height. In his address to the Congress, he presented the war in his eloquent words as a struggle for abolition of slavery solidly grounded on the lofty universal and moral principles of humanity. He knew that only the language of moral height and conviction could justify the war and mobilize the support for the prolonging war. The celebrated Emancipation Proclamation (January 1863) aims at creating military advantage for the North and not as much at liberating the slaves in the South. It proclaims freedom only for those slaves who would rise up against their owners in the South to join the federal army. Until the 14th Amendment was ratified in July 1868, reaffirming the full citizenship regardless of race and guaranteeing the due process of law for all citizens, nothing codified the freedom of the slaves nationally or otherwise. Even after the 14th Amendment, the struggle of the Negros continued, as it still does.If Robert Lee was a military fox in the South, Lincoln was his counter part in politics in the North. For example, he out maneuvered a group of Senators who wanted to sack his Secretary of State, William H. Seward, unbeknownst to Lincoln, for prolonging the war. The way Lincoln out did them should be written in the manual of political art for generations of politicians to emulate. But Lincoln should be remembered as one of the greatest in American history for his patience, the patience exercised through the long and difficult years of the war and through his wife's erratic mood swings. His untimely death on April 15, 1865, a few days after Lee's surrender on April 9, memorialized him to eternity but also undercut the Reconstruction of the South, ushering in the era of the rampant corruption of American politics and businesses, the era of to what Mark Twain called "the Gilded Age." But it was Lincoln's spirit of tolerance and compassion, conveyed to General Grant during a brief meeting held only a few days or weeks prior to the assassination, that went a long way to a peaceful surrender. There were some great soldiers in the South: Stonewall Jackson, Albert Sidney Johnston, and others. They were gallant men who did not fear death. They fought because they were soldiers and nothing else. Ulysses Grant, though a great general, was lousy as President. Robert Lee and Jefferson Davis (the first and only Confederate President) embodied the southern chivalry and gallantry. Sheridan who brought a victory for Lincoln to win his second term applied his great military skills after the War to killing the Indians, proudly declaring: "The only good Indians are dead Indians." As Shelby Foote notes, the only tangible benefit the nation reaped from the War was the sense of the indivisible one nation. The soldiers had the taste of the lands, rivers, and mountains all over the South. The sons of Ohio, for example, died in battle and were buried in Tennessee; and vice versa. But was it all worth it? Is war the mother of all things, as Heraclitus said? War is futile. It is nothing but administration, a matter of obtaining and allocating resources and of achieving the end in the most efficient way. But we must remember, as Levinas reminds us, that there were alters before there were wars. This last volume of Shelby Foote's narrative history of the Civil War is massive. As well written as it is, as colorful and as moving, I can not imagine anyone being able to absorb everything even in this last volume. It starts with the little known "Red River" Campaign and continues to Appomattox. But, in truth, there are 100+ pages after Lee's surrender, as he chronicles each surrender the confederate made (there were at least four) and the capture of CSA President Jefferson Davis. Foote's compelling motivation seems to have been to "tell the story" as clearly as possible to give dignity to those who lived it. His book is free of footnotes, references to other works or editorial comments. He is content to let the characters speak for themselves. Still, it is as accurate as a telling of the war could be. He takes us back to that world of handwritten notes, horses and companies turning the flank. It is a world of well known generals and little known soldiers, of self righteous politicians and freed slaves. Foote tells it all: land battles big and small, naval battles, political battles, personal battles. Anything that happened seems to have been fit to include. Looking back over 40 years it is interesting the choices he makes. Lincoln's assassination is told clearly but matter of factly. There is no biography of Booth. Yet there is a whole section about a renegade CSA naval ship that traveled the globe destroying whale ships and avoiding capture -- all after Lee's surrender. Jefferson Davis bookends the whole three volume wok. He is the opening character in volume one and he is the last word some 2500 pages later in volume three. The book is an achievement, a narrative so complex it is astounding to see Foote handle it. I admit the battle scenes were confusing as I kept getting the officers mixed up. And I would say that the more you know about the war the more you will enjoy this valuable narrative. The author says somewhere, "if you don't know the Civil War, you don't know America." Foote marches us through four long years that shaped America as much as any other in our history. His telling is narrative style through the military campaigns of Virginia, the West, and on the rivers and seas. The personalities are large on his stage but background to the march and clash of armies. Having been ignorant of much but the sheer basics of North v. South, Foote explains the southern perspective in a way I had not previously understood. Some accuse him of "sympathizing" with the southern cause. I don't take it that way. To me it is helpful to see the devotion of the Jefferson Davis and the Confederate generals. They possess no degree of courage and honor that is not far outweighed by the contradiction inherent in their cause. A free Confederacy fighting a Second American Revolution which preserves their "peculiar institution" is ludicrous. On the other hand, the blood shed by the Union succeeded in subduing the Southern territories, but not the Southern hearts and minds. And really not the Northern minds either. The sacrifice of lives and treasure secured the Union but unfortunately did not win the peace. We have been grappling with the unfinished results ever since. As a result, I completed Foote's volumes with an enormous sense of sadness--a tremendous cost was paid for what Foote describes, in the coming period of Reconstruction, such little result. Now more than 100 years later, there is much to hope for to finish the work begun then. But not in our country's current state of ignorance (and I'm not directing this at any particular side). I regret my own and owe Foote a debt of gratitude for shining a light. I invite others to join me in getting to know America so we can finish the work together. The first two volumes of this trilogy are full of Southern victories. In the third volume, the tenor of the war changes, with more and more Northern successes, as the overwhelming numbers and resources of the Union finally take their toll. Although both sides occasionally faced starvation for both horses and men (the armies had to take forage with them), the threat became much realer for the Greys, as the war ground to a close. Indeed, Union troops cut off Lee's access to further supplies, which in part led to his surrender at Appomattox. As with the first two volumes, the third continues the author's apparent preference to rarely mention dates. And because a particular battle is frequently told from the standpoint of both sides, but separately without clear identification, I sometimes found it difficult to track what was going on. That said, there can be no doubt that this trilogy is a monumental contribution to the literature of the Civil War. This is good narrative history. Foote is excellent at turning what must have been thousands of letters, orders, and reports into lively and (mostly) compelling prose.One caveat: at one point, these books were seen as offering an evenhanded depiction of the North and South. Many modern readers may disagree. I will illustrate this with only one example. Foote describes, with great fervor and no apparent irony, the gross injustice and humiliation that Jefferson Davis endured when put in chains for a few days in 1865.A second caveat (much less serious): These books are very long, and so some descriptors will inevitably be repeated. But if I ever hear the phrase "the red-headed Ohioan" to describe Sherman again, I will explode. The final volume of Foote's magisterial epic continues with beautiful writing, sharp insights, and a general (if mild) Southern sympathy. While obviously a colorful character, Foote devotes more attention to Nathan Bedford Forrest than is strictly warranted. But that's a minor quibble. The first volume started with Jefferson Davis taking the oath of office for the Presidency and ended with his death. It's fitting that Davis bookends the trilogy and while some might call that unduly sympathetic to the South, I didn't think so. Thematically it makes the most sense.Other works go into more detail and probably correct some of the things Foote got wrong or overstated (or understated). But calling this "The American Iliad" is about as accurate a description as possible. I have just finished this majestic trilogy and feel a sense of awe at both the events and people the work describes, as well as the incredible talents of the man who devoted so much of his life to tell their stories. This trilogy has taken its place now as my favorite book, not just of history but of any kind. I am sad to come to the end of this journey I have been on for the past almost five months. It is one I will treasure always and am sure I will repeat many times throughout the years to come. The longest book of the three, I read it the fastest. For the first half, I just wanted to get to the end. The soliders are exhausted, sick, and and deserting. The generals are overwhelmed and getting sloppy. The war loses any elegance and descends into an interminable slugfest. It's when Sherman and Sheridan kick things into high gear that you feel that the thing might end. I also enjoyed getting to know Jefferson Davis, in all his strength and delusion as to the ultimate trajectory of his nation. a truly fascinating and detailed account of the end of the civil war. i've spent about a year reading this trilogy, and it was well worth it. as Lincoln said after this re-election in 1864: "In any future great national trial, compared with the men of this, we shall have as weak, and as strong; as silly and as wise; as bad and good. Let us, therefore, study the incidents of this, as philosophy to learn wisdom from, and none of them as wrongs to be revenged." I would not presume to try and critique this great mans work.It was a great experience to read all three of these works of art. If you can only read one book on the American Civil War, this is probably the best choice. And that is a bit of cheat since it is actually three books. Reading all three is time very well spent. Shelby Foote - Shelby Dade Foote, Jr. was an American novelist and a noted historian of the American Civil War, writing a massive, three-volume history of the war entitled The Civil War: A Narrative. With geographic and cultural roots in the Mississippi Delta, Foote's life and writing paralleled the radical shift from the agrarian planter system of the Old South to the Civil Rights era of the New South. Foote was relatively unknown to the general public for most of his career until his appearance in Ken Burns's PBS documentary The Civil War in 1990, where he introduced a generation of Americans to a war that he believed was "central to all our lives."